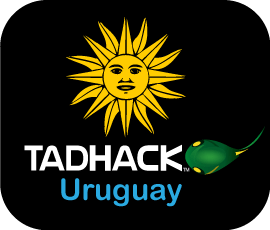 TADHack-mini Uruguay took place on the 10th and 11th May (Tuesday and Wednesday) at the Universidad ORT Uruguay (Campus Centro) in the vibrant city of Montevideo. We are grateful for Universidad ORT Uruguay’s cooperation in making this event possible. As at every TADHack around the world the enthusiasm, creativity, and skills are world class. Because of the University rules we could only run during the week, a couple of developers actually took time from work for TADHack, amazing. 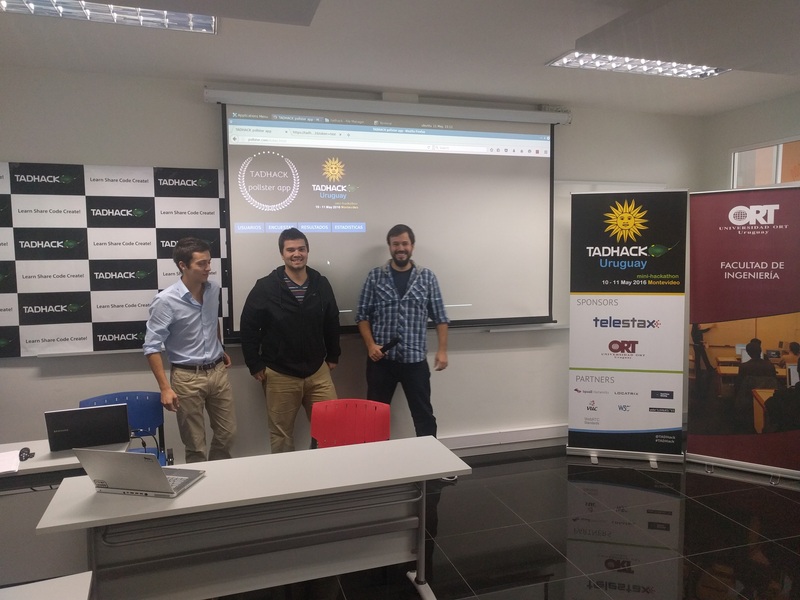 Telestax sponsored TADHack Uruguay, and Locatrix was a partner. 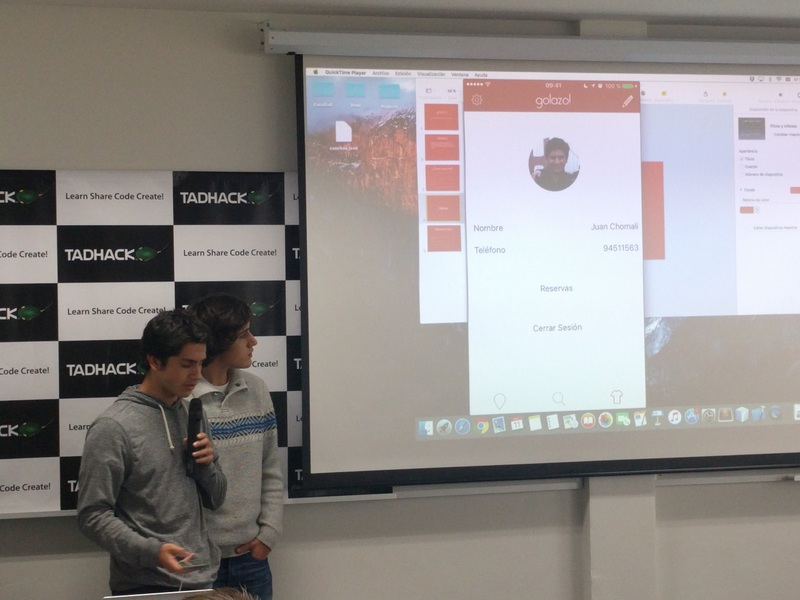 Hack “Golazo!” by Juan Chomali (17 years old) and Francisco Camejo (19 years old) is an App for football / soccer fields reservations. It shows the football / soccer fields in a map and you can make a reservation through there. The field manager receives an SMS and can confirm or deny the reservation. The user receives a confirmation SMS. They were joint winners of the Telestax prize. 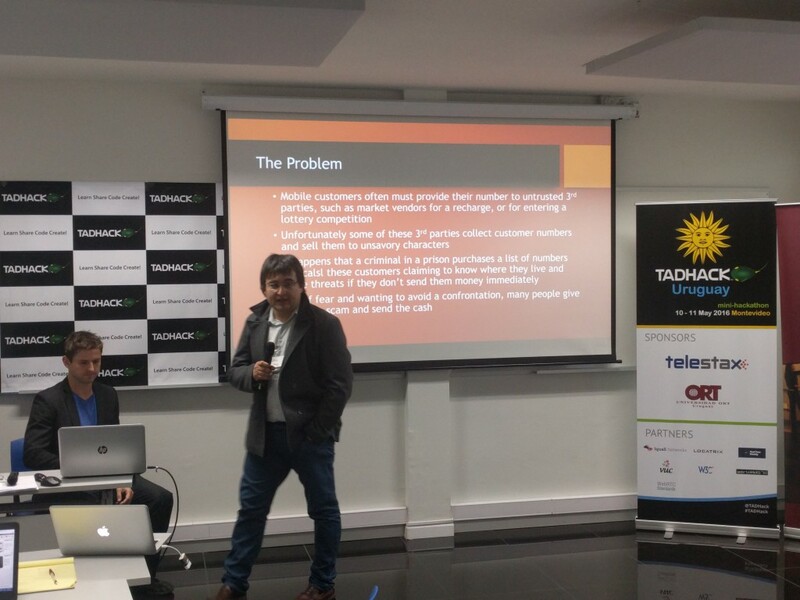 This is a highly locally relevant application, like Tardy Support at TADHack Japan, it had all the Latin Americans in the audience wanting it. 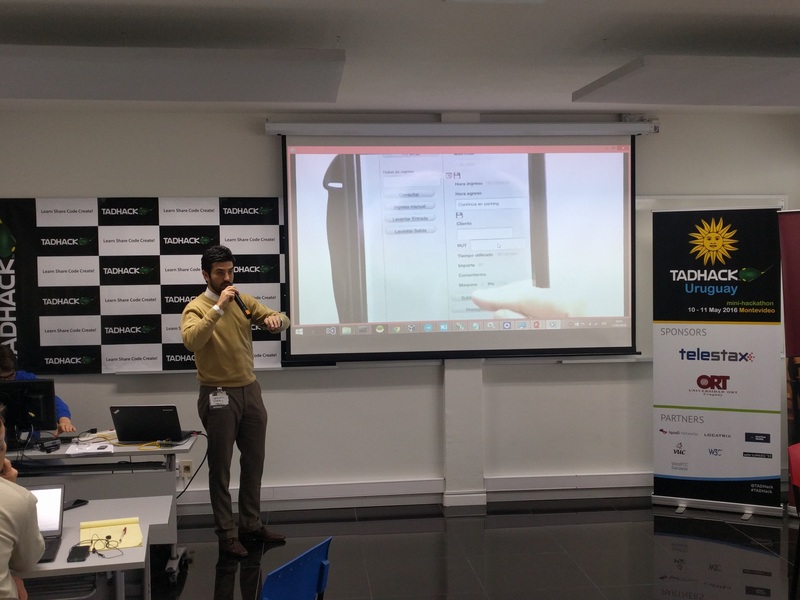 Hack “POLLSTER APP” by Andres Canabarro, Sr. Miguel Ignacio Sica, and Herman Schenck: Do you want to launch any type of survey quickly and efficiently? Do you lack of enough clients to make your survey? Pollster App is designed just for you. Pandemic detection, marketing services and political analysis brought to you in just one click. They were joint winners of the Telestax prize. The guys started 24 hours ago with no knowledge of Telestax, and within 24 hours had created a sophisticated service. 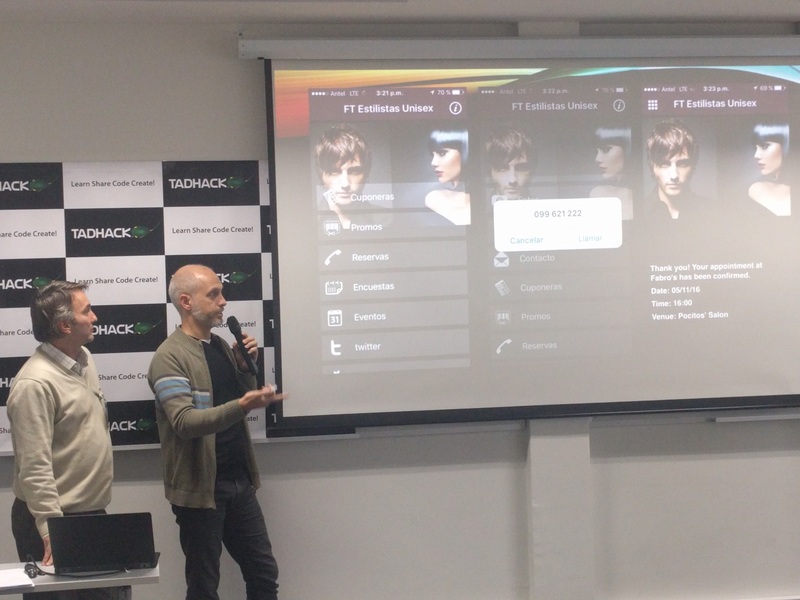 Hack “Promos and Reservations” by Nicolás Eidelman, Valentina Egger, and Matías Jimenez offers the possibility to different service providers (like hairstyler, etc.) to offer promotions and reservations. Hack “JAL” by Andrew Eross, Julio Rey, and Leonel Hernandez offers MSISDN (Mobile Subscriber ISDN Number) obfuscation and call connection system, with USSD ID (Unstructured Supplementary Services Data Identity) management, supporting both SIP and PTSN connections, for the purpose of allowing anonymized calling and recharge. Another highly locally relevant hack, which had all the Latin Americans in the audience how quickly this service could be deployed in their location telco, or whether it could be deployed outside of their telco. Hack “Home Automation” by Enrique Serra, Leonardo Horovitz, and German Otero” enabled controlling any kind of device can be easy using RestComm technology. This time they focused on home automation. Remote hack Domokom was created by Hubert Z?gota and Dominik Miodunka, from ProIDS in Poland. Domokom makes your intercom via mobile! Answer guest ringing at you door using your mobile device – phone, tablet, etc. Only an internet connection is required. You talk and even open the door from any location – be it your garden on skiing slopes, or from the comfort of your armchair! The hack used a Raspberry Pi, and Telestax RestComm. They had lots of ideas on how this hack can be extended. Remote showcase “MG-XOT System, for backup the Configuration and Billing files of the AXE-Ericsson Central Office” was given by Mario R. García Mayer by REDCONTEL (Research & Development Control Telecommunications) in Mexico.